If I have to rank my favorite root vegetables, the list would definitely start with beets. From a reach dark ruby color to a delicate taste I love it all in the beets. My culinary experience with it is wide: beet juice, pickled beets, raw beets salad, baked beets salad, stews, and the king of all - the borscht. 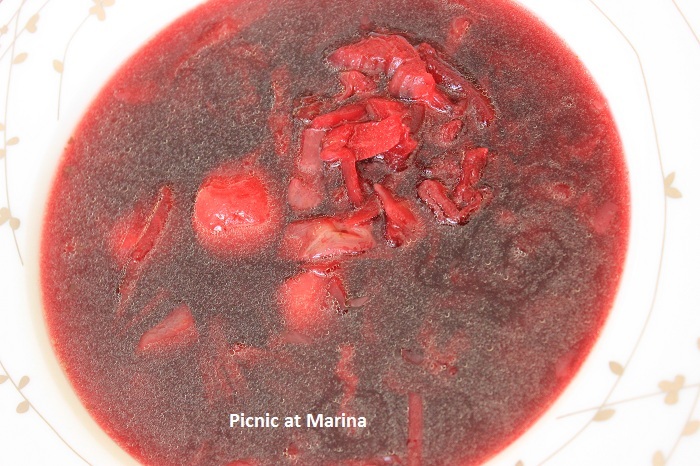 This summer version of the borscht is great either cold or warm. When I was babysitting last week, I made borscht from the ingredients that were available in the kitchen. Actually, all you need for summer borscht are beets. 1. In a large bowl combine shredded beets, apple cider and the sugar. Mix and set aside. 2. Start in a large pot you will be cooking borscht with heating the olive oil, then add onions and saute it until golden brown. 3. Add beets and stir it 2-3 minutes. 4. Add water or stock of your choice (I prefer to use water for this summer version), bring it to a boil. Less water will make the borscht thick, so you choose how much water to add. 5. Add potatoes and cabbage, reduce heat to a medium and simmer until potatoes are done (about 15-20 minutes). 7. Enjoy it warm, with a dollop of sour cream on top, or cold (my personal favorite to eat it cold next day when all the flavor blends). I love beets but I've never had borscht. I must try it! I LOVE beets! they are nature's candy! I love them roasted, they just turn into the most wonderful things ever! Beets and dates (medjool) - plants at their finest! Do you know the recipe for your grandma's borscht? I am sure it's delicious! I love beets but I never taste any borscht. I will, it's a promise! Please, let me know if you like it! It is very easy to make, about 20-25 minutes of your time and you have a perfect meal for a hot summer day (I like it cold during the summer). 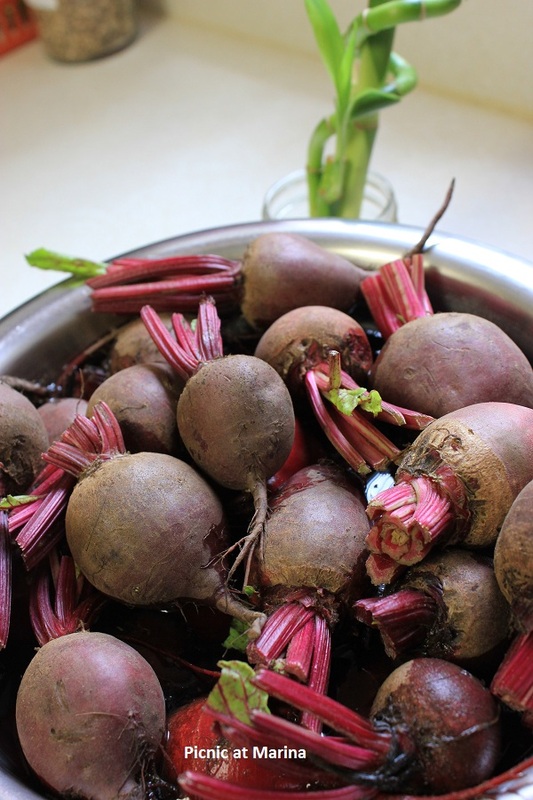 Beets are so sweet when they are fresh from the garden or in season at the stores. What a good wholesome recipe! I'd love to try this! Thanks! This beetroot soup looks amazing! A must try. Thanks Marina!! 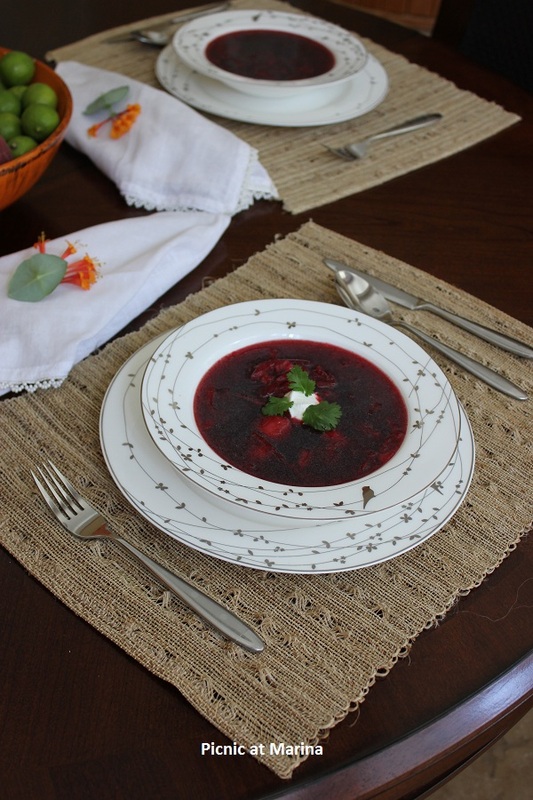 I have always wanted to make Borscht, but never had had enough beets or a good recipe to try! I love that cat, he is soooo pretty! Love the recipe for Borscht..i love beets and can eat them every single day! Hello my friend! I am the same! This is something I love and always wanted to make thank you for sharing you recipe. One unique combo! The photographs are just mind blowing. I love beetroot and beetroot soup. I've just started playing around with cold soups so I think this is one for the late summer. 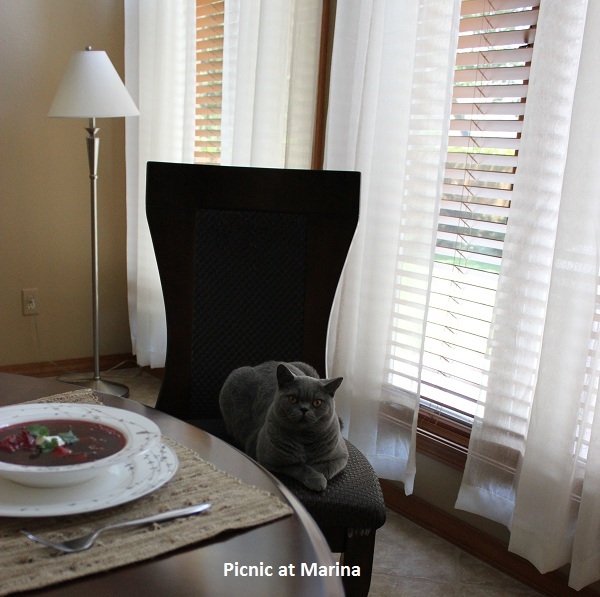 I'm scared to try it, but you did an amazing job with the borscht. Really nice recipe. You can do so much with Borscht! This is a nice, light version. I've been seeing good beets in the market lately, so I need to get busy. Good post - thanks. Oh, Marina! I love, love your borscht, your amazing photos, your kitty...so, so cute!